FCC has released the final draft of its proposal to kill net neutrality. The full document is nearly 200 pages long, so it will take some time for everyone to go through it all. So far, it’s clear that the Commission is stripping itself off the powers that enable it to keep ISPs in check in the name of more investments. The Commission also believes that there shouldn’t be any concerns about ISPs misbehaving since there are consumer protection and antitrust federal laws that could be used for these issues. The proposal calls the landmark 2015 net neutrality ruling as a “legally flawed approach.” Ajit Pai, the Chairman of the FCC, also wants to reclassify broadband internet service as an information service and not a utility. “In the communications industry, incumbents have often used Commission regulation under the direction of the “public interest” to thwart innovation and competitive entry into the sector and protect existing market structures,” the proposal reads. This means that if this proposal is approved in December, Title II regulations would no longer apply. 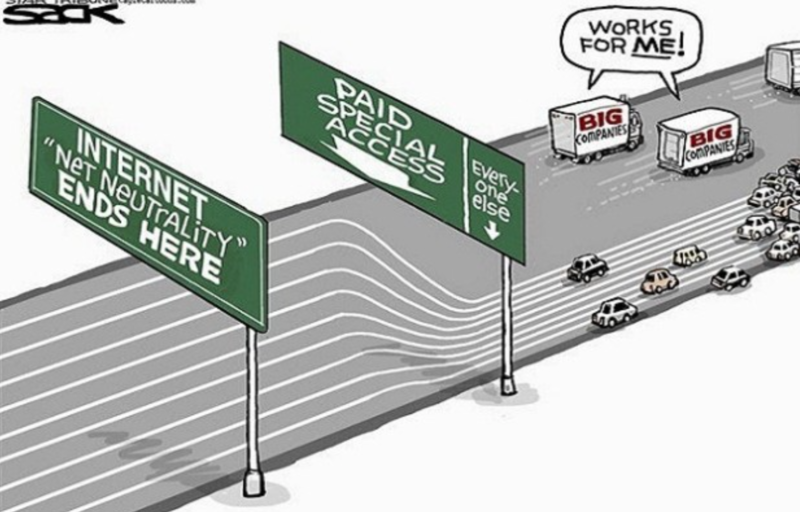 The new proposal also empowers internet providers to introduce fast lanes and kill the startups who are unable to pay for these lanes. Pai argues that those small tech companies can fight such issues under antitrust or consumer rights federal laws. The Commission is, in fact, suggesting that startups might even benefit from these fast lanes as they could demand more money from their investors. Under this new proposal broadband companies with their monopolistic powers can prioritize their own services and products and block any competitive content. According to the Commission’s own data shared in 2016, 51% of Americans have only one choice of broadband service and 38% have just two choices. In such a market, it would be impossible for a user to simply switch to a better option. The only thing that the new proposal is keeping from the existing net neutrality rules is for the ISPs to publicly disclose when they are engaging in any of the above. When Comcast first started to discriminate against online content in 2008, an Associated Press report and a subsequent campaign run by the Electronic Frontier Foundation had pushed the agency to stop Comcast from blocking BitTorrent on its network. The internet provider was found interfering with “certain sorts of traffic on its network,” that included but wasn’t limited to BitTorrent. Under the new proposal, FCC won’t have any powers to stop Comcast and other internet providers from blocking what they want to block. The proposal suggests that the companies can challenge these cases under – again – antitrust or consumer protection laws on a case-by-case basis. However, as The Verge notes, it doesn’t say exactly who “would bring that suit against Comcast and bear the costs.” Would it be the users of BitTorrent or FTC? While Pai has continued to say for the past several months that nothing was wrong with the internet before 2015 when the net neutrality rules were passed, a lot actually happened that had finally given way to those rules. Since its inception, internet access was guided on the principle of freedom and no-interference. Once the ISPs started to interfere with the applications and content, it became critical for the government to enforce actions that stopped such discriminatory conduct. The government imposed merger conditions (now removed by Pai) and introduced enforceable rules. The goal has remained the same – no one should be able to decide what the consumer sees on the internet. ISPs should not be able to pick winners and losers favoring some content and blocking the rest. However, all of this is going to change when these new rules get approved. Before repealing these rules that were passed after “actual” problems started to arise from unfettered powers that ISPs had, the Commission was also required to take public comments, which it did. It now says that over 7 million out of 21 million comments were “fake” and had reported a DDoS attack during the comment period. However, it is unclear why the Commission is failing to provide any evidence or give access to the systems when the New York State Attorney General Eric Schneiderman has continued to offer assistance. The AG’s office during its investigation contacted the FCC at least 9 times over 5 months but didn’t receive any response from the Commission. It remains clear that the agency isn’t willing to take into account what the public wants. In the end, nothing can potentially be done after this new proposal (full text) is approved, but Americans have until mid December to call their representatives. The voting will be conducted in an open meeting on December 14.